The NEW MOTOTRBO IMPRES ATEX Multi Charger offers a smaller and lighter platform with integrated programming and fleet management features for all current and future radio families across the MOTOTRBO ATEX and non ATEX portable two way radios. 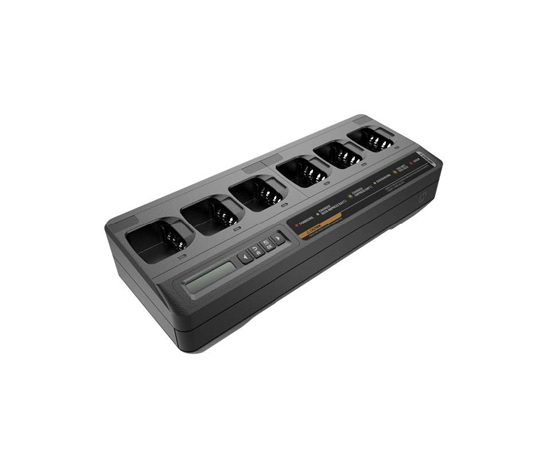 This introduction is the first of a series of multi-unit chargers that allow up to 6 radios or batteries to be charged simultaneously as well as support integrated data upload to an IMPRES Battery Fleet Management System without the need for a separate CIU (Charging Interface Unit). In order to comply with the International Air Transport Association (IATA) regulation stating that lithium-ion cells and batteries must be offered for transport at a State of Charge (SoC) not exceeding 30% of their rated design capacity, the charger sets the State of Charge of the battery to a low value (typically 25% of rated capacity) permitting for bulk air cargo shipment. The new MOTOTRBO IMPRES ATEX Multi Charger can also be set for long-term storage enabling the IMPRES battery to reach a State of Charge suitable for storage for a long period of time in an environmentally-controlled storage location or facility. Using the display, a series of options allows choosing a default of 50% of rated capacity or customizing the values required based on what is stored in the battery memory. Long-term storage at 75% rated capacity is also available for scenarios requiring the stored battery to be at a higher SoC, minimizing full-charge time if the battery must be quickly fielded.